Feta is a soft and crumbly white cheese that originates from Greece. It was originally produced using sheep's milk, although now most commercial makers of feta use cow's milk. 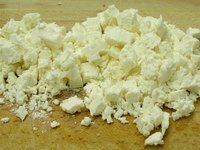 Feta is stored and cultured in a whey brine, thus giving the cheese its distinctive salty taste. If you find the salty brine taste of feta cheese too strong, it is possible to lessen or remove this taste. Put the cubes of feta into a strainer or a sieve. Rinse the cheese under a cold tap for about one minute, then tip the rinsed feta into a bowl. Pour milk into the bowl on top of the feta cheese, so that the milk covers all of the feta. Place the bowl into the refrigerator and allow the feta to soak for three to five hours. Drain the milk from the feta using the strainer or sieve. The salty taste from the feta will now be removed, or at least reduced. Try soaking the feta cheese overnight for even better results. Make sure you do not leave the milk and feta out of the fridge while soaking or they will spoil. Can I Freeze Feta Cheese?